Sailing is both a technical and tactical sport. Athletes need to be masters of their boats, getting the most out of them in terms of speed and performance. They must also be able to adjust to changing conditions, and race tactically to ensure the best position at each stage in the race. Mastery over ever-changing conditions on open water requires skill and nerve. Both will be essential for competitors in the sailing events at London 2012 over 14 days of competition that should offer plenty of excitement and drama in the beautiful but testing waters of Weymouth Bay, on the south coast of England. Gybing: The act of turning a sailboat across the wind, downwind. Tacking: Turning a boat from one side of the wind to the other by steering through the eye of the wind. Hiking out: Leaning over the side of the boat to balance it against the force of the wind. 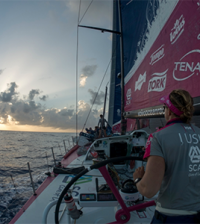 OCS (On Course Side): A boat deemed to have started a race prematurely, meaning it is subsequently disqualified from the race and awarded the maximum number of points. Luffing: Altering course towards the wind. There are three disciplines – match racing (one against one), fleet racing (mass start) and windsurfing – and ten classes of boat. Crew sizes vary from one to three, with Laser, Laser Radial, Finn and RS-X classes featuring one sailor; the 470, 49er and Star featuring two and the women’s match racing, three. Competitors contest ten races (15 for the 49er) with points awarded depending on finishing positions in each race (one point for first, 41 for 41st). Each boat is allowed to discard its worst score and the ten boats with the lowest accumulated scores qualify for the medal race; where points scored are doubled and added to the opening series’ scores to decide the top ten positions. Britain has topped the medal count in sailing at the last three Olympic Games so watching any of the Brits compete will be great fun filled with lots of excitement and potential. 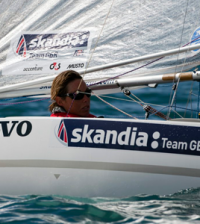 In the women’s 470, newly crowned world champions Saskia Clark and Hannah Mills (pictured) are definitely exciting to watch at the moment and the GBR Match Race Girls team of Lucy McGregor, Kate McGregor and Annie Lush are one of the top International Women’s Match Racing Teams out there. And GB’s Bryony Shaw for the windsurfing event. 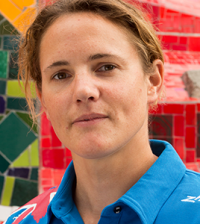 She won the bronze medal in the women’s RS:X class at Beijing in 2008; the first ever women’s windsurfing medal for the British Olympic team. This will be the last time windsurfing is in the Olympics as from Rio 2016 it will be replaced with kiteboarding. And of course we can’t go without mentioning three times gold and silver medallist Ben Ainslie – a hugely exciting prospect for London 2012. Lisa Westerhof and Lobke Berkhout of Holland in the 470 are huge competition for Saskia Clark and Hannah Mills. Together they are double world champions and have two Olympic appearances between them with five time world champion Lobke Berkhout winning a silver medal at Beijing. British sailors are the most successful in Olympic history having won 50 medals, including 25 golds, since sailing was introduced to the Olympics in Paris in 1900.